For the last three years, at the beginning of each year, it has been our custom to do just that. I have the privilege of studying the life of a “hero of the faith,” and presenting the “outcome of their life” to you in the form of a biographical sermon that we call “Footsteps of the Faithful.” Our prayer is that you and I would imitate their faith, and be reminded that Jesus is the same, yesterday and today and forever. In other words, their Jesus is our Jesus. Thus far, we’ve considered the lives of George Whitfield and William Tyndale and I hope that you will join us this coming Sunday, we will study and learn from the life of Hudson Taylor. 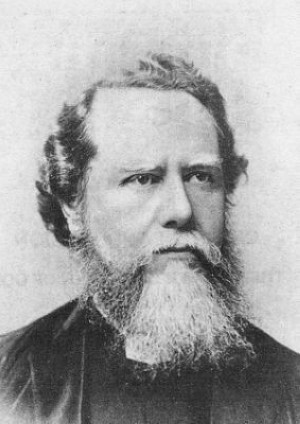 Hudson Taylor (1832-1905) is often referred to as the founder of modern missions. He is best known for his work in founding the China Inland Mission (now Overseas Missionary Fellowship) which impacted China for the gospel in countless and supernatural ways. But, the focus of this Sunday’s message will not mainly be on facts and numbers, although those are astounding and worth careful consideration. The focus will be on Hudson Taylor’s private life. What was Hudson Taylor like as a man? What was he like behind closed doors? What role did prayer and dependence upon God play in his ministry? How did he deal with struggles and temptation? What can God teach us from his life? How can we be encouraged to press harder into Jesus in this new year by reflecting on the life of this saint? I pray that you will join us this Sunday as we consider Moving Men by God–Inside the Life of Hudson Taylor. It has been a joy to study the life of such a witness to King Jesus. It was said of Taylor that he was “small in stature and far from strong. . .always facing physical limitations. . . But above all, he tested the promises of God and proved that it was possible to live a consistent spiritual life on the highest plane.” And that he did. Through tragedy, personal loss and setback after setback, Taylor’s joy and resolve only strengthened. How could this be? What was his secret? Join us this Sunday to find out. Pray that God would prepare you to set out this year to know Him like Hudson Taylor knew Him–a God that could and would provide for those who seek Him. . . That even when we are faithless, He is faithful, for He cannot deny Himself (2 Tim. 2:13). I’ll look forward to seeing you this Sunday at Redeemer! Blessings in Him this New Year!